NMX is a community for content creators, and nothing makes us happier than highlighting those who are as passionate about new media content creators as we are. The NMX community is made up of people who love nothing more than to create content online; they’re bloggers, podcasters, and video producers. They’re also passionate about photography, writing, and finding new and unique ways to reach their online communities. The creative process: The NMX community can geek out for hours about what it takes to get an idea from head to final product. Monetization: As most of the NMX community create content for a living or would like to create content for a living, tips on ways to earn money as a new media content creator are always appreciated. Distribution: Feel free to share traffic, SEO tips, and other ways to bring people to our content. Content hacks: Are there things content creators can do to be more efficient, productive, or profitable? We’d like to hear from you! Opinion: We love respectful opinion and analysis regarding current events as they relate to content creators. Humor: Humorous cartoons, essays, and lists are fine – as long as, again, they relate to content creation. Product reviews: Did you read a book or test out an app you feel will help content creators be better, stronger or faster? By all means, share! Except one thing – It can’t be your buddy’s product that you received for free and you have to have used or read it yourself. Advanced content: The NMX community doesn’t to know why they need to create content, they need tips for making it better, smarter, and faster. Posts by content creators who know the NMX community: Guest bloggers should know NMX, both the conference and the community. You should know who we are, why we are here, and why 3,000 content creators come to NMX every year. Content doesn’t have to be general, however. You can specifically target it to different types of content creators. For example, you can write a guest blog post specific to podcasters as opposed to content creation as a whole. tl;dr It may look like we have a lot of bullet points here, but we’re not asking for much. Guest blog posts should relate to content creators and the content creation process. If you’re unsure of what that means, please move on to the next section to learn what we’re not looking for. It probably should be noted here that NMX is an “influencer free” zone. We’re not looking for ego stroking, back slapping, or blog posts about how wonderful you are. We’re not looking for social media related blog posts unless it’s a new thought or idea that has everything to do with content creation. Post that are overly basic: Assume the NMX community knows a thing or two about creating content. Assume we already know why we need to blog or podcast or tweet. Assume we are all creative people and have a content platform of choice and are already using it to create content -whether for hobby or profit. Intermediate and advanced content are especially welcome. Posts from people who know nothing about NMX: If you’ve never been to NMX or spent time with the NMX community online, please wait before sending your idea to us. Read the NMX blog, follow us on the social networks, and spend time chatting with our community of content creators to learn what we’re all about first. Post that are geared towards brands rather than content creators: Most of the NMX community are interested in creating content for themselves or for their jobs. Most of the NMX communities are independent contractors rather than part of a marketing team. Blog posts should take the point of view of the content creator. Selling: We didn’t fall off the turnip truck yesterday. We know you’re sharing content in order to promote something. However, we’ll pass on any posts that offer a hard sell (or any sell), or are overly self promotional unless it’s sponsored, and even then we’re not putting out sales copy. Jargon: The NMX community prefers you talk to us in plain English. We don’t speak jargon. Marketing: NMX isn’t a marketing or social media marketing conference. So please hold off on posts about why we need a Google+ brand page or 10 Tips for Awesome Brand Engagement. Bravado: Please check your ego at the door. Learn more about NMX and who we are here: NMX: You’re Right, It’s Not the Same. This isn’t our first rodeo. 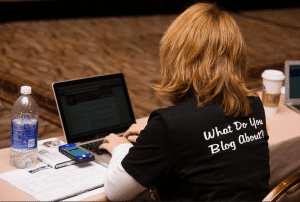 We know you’re submitting a guest blog post to the NMX blog for a reason such as back links or book promotion. We’re very cool with that. There’s nothing we enjoy more than helping to elevation new media content creators and help them to achieve success. Your byline: If you’re approved as a guest blogger, we’ll set you up on the NMX blog as a contributor. This will enable you to blog using your own clickable byline, and all blog posts you submit for approval are easily searched by clicking your byline link. Your bio: All guest bloggers can add a paragraph about themselves at the end of their blog posts. A link back to your blog or website: You may include a link to your blog, website, or sales page in your bio. Promotion from NMX: We’ll share guest blog posts in our weekly newsletter, on Facebook, Twitter, and other social channels. First, thanks for reading all of the above – I know I threw a lot at you. If you would like to submit a guest blog post or idea for consideration on the NMX blog, feel free to send it to me at debbie@nmxevents.com. I get a lot of email each day so it may take a few days to hear back from me, but I promise to give your idea every consideration and get back to you as soon as possible.